Celebrating the New Year is always filled with champagne and sparklers. But when you have kids, going out to parties get shoved aside in favor of soda, noise makers, and a televised ball drop. Instead of just watching the New Year change, why not have a kid-friendly New Years Eve (NYE) celebration? Who is stopping you from having a glass of champagne on NYE? Why not break out some sparkling cider or even some ginger-ale in a plastic flute to make your kids feel grown up and special? Make some festive and bite-sized foods to eat during the festivities. Whether you are having a party with your own family or invite some friends and their kids over, plan out some activities and snacks to enjoy throughout the night. Have a dance party with plenty of funky accessories and a photo booth using a curtain rod and plain backdrop, get a piñata for and fill it with your favorite candies, and make a time capsule to open next year. If your kids can’t make it until midnight, ring in the New Year at noon instead. 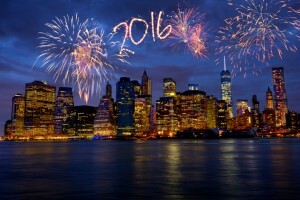 NYE is celebrated throughout the world with many different traditions. Set up stations ofr your little ones with these traditions to help them explore different cultures. Put out a bowl of grapes for Spain. The Spanish eat 12 grapes just before the clock chimes midnight to symbolize good fortune in the 12 months ahead. Some cultures believe that eating ring-shaped foods like donuts bring good fortune onto the house. The custom of making resolutions started in 2,600 B.C. with the Babylonians to help reflect on the past and plan ahead. Yours kids are growing up so fast. Don’t let a holiday like New Years Eve pass without a fun and festive holiday. Invite the neighbors and get ready to sing Auld Lang Syne because here comes the New Year! Happy New Year From Harborside Village! This entry was posted on Sunday, December 20th, 2015	at 1:59 am	. Both comments and pings are currently closed.